Lower back pain is a common health issue among adults of all ages. So common, in fact, that the Mayo Clinic estimates that 4 of every 5 people in the U.S. will experience at least one an episode of low back pain at least once in their lifetime. There are many effective treatments available for lower back pain, but many of them involve prescription medications or surgical intervention. There is, however, another less intrusive option: a back brace. There are many different types of back braces available for treating mild to severe lower back injuries. Common causes of lower back pain are muscle strains, slipped discs, degenerative disc disease arthritis, and diseases of the bones and joints. Studies show that back braces not only provide relief from the pain associated with these conditions, but they may also aid in the treatment of these low back problems and help correct posture. One such study, published in the 2015 issue of PLoS One, suggests that wearing a back brace can significantly improve postural steadiness and decrease sacroiliac joint-related pain. Back Braces work by limiting movement in the torso area and relieving excess pressure on the spinal spine. This helps prevent further injury to the lower back and speeds recovery of the muscles, ligaments, and tissues of the lumbar region. It should be noted, however, that while back braces can be a good non-invasive option for treating back pain, they are not intended to completely replace professional medical treatment. If you’ve been experiencing low back pain for longer than two weeks, it’s a good idea to book an appointment with your doctor to rule out a more serious problem. There are three main types of back braces that are designed to aid in the treatment of lower back conditions: flexible, semi-rigid, and rigid. Flexible: These braces are usually made from a soft fabric like cotton blends, canvas, or neoprene. Flexible back braces are available in several designs, including corsets, lumbar belts, and sacroiliac belts. Flexible back braces apply light pressure to the torso to gently correct posture and relieve excess pressure on the spinal column. Semi-rigid: Semi-rigid braces have support stays incorporated into their design to provide added stability and support. These braces may also have extra padding or removable plastic inserts. These braces help keep the spine in place while shifting excess pressure from the spine all column to the abdomen region. Rigid: Rigid braces restrict movement of the torso to prevent further injury to the back. These braces are typically used after a back surgery or for scoliosis. As such, they can only be ordered by a surgeon, orthotist, or physical therapist. Here are a few things to consider when shopping for a back brace. Back braces come in a variety of materials, including cotton, nylon, elastic, and moulded plastic. A good material will provide adequate support for your lower back while offering enough flexibility for engaging in everyday activities. An adjustable back brace is a good idea if you want to be able to tighten or loosen the brace as needed throughout the day. Adjustable braces are also ideal for budget-conscious individuals who don’t want to have to purchase different back braces for different activities. If you are very active or perspire heavily, you’ll want to make sure your brace is made of a breathable fabric that will keep you cool and dry throughout the day. Not all back braces are sized accurately. Be sure to check the dimensions of the brace you are buying, and read customer reviews to get a better idea of how well it will fit. The degree of back pain you are experiencing will determine the level of support you need. A flexible back brace is ideal for those who only require minimal support. Those who need extra stability will want to choose a semi-rigid design. Some braces come with suspender-style shoulder straps, which are recommended by experts for those requiring extra lower back support. In this section, we’ll review the best back braces available on the market today. We’ve based our recommendations on the degree of support these braces provide, their ease of use, and overall customer satisfaction. The Back Brace by Sparthos promises to deliver immediate relief from pain caused by herniated discs, sciatica, scoliosis, aching muscles, and other lower back conditions. It has an adjustable, removable lumbar support pad that provides extra support and compression to the lower back area. This brace also features dual adjustable compression straps that allow you to easily adjust the tightness to your liking. Vertical support stays offer extra support for the back while also preventing the brace from rolling up. We love the lightweight design of this brace, which allows it to be worn comfortably under clothing. Another plus is its breathable fabric, which wicks away body moisture and ensures the brace remains cool, dry, and comfortable all day long. The flexible design of the brace offers superior support and stability for the back without restricting your natural movements. 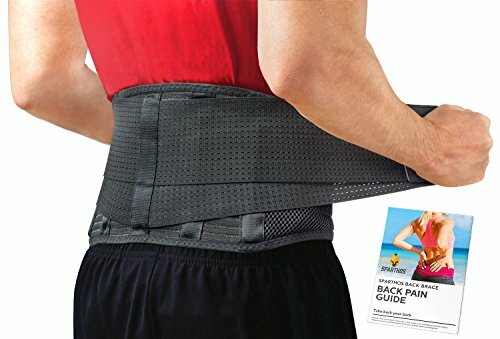 WIDE back support for more coverage! With its adjustable elastic side panels, double-pull design, and stability enhancing criss-cross design, it’s easy to see why the NEOtech Care Back Brace is one of the most popular back braces on the market. This brace is designed by back experts to provide support to a wider area of the back and aid in the treatment of sciatica, slipped discs, and degenerative disc disease. The double-pull design of the NEOtech Care Back Brace adds extra compression where you need it most, while the heavy-duty elastic strap offers superior stability and support. An inner wrap provides extra comfort and heat retention to relieve low back pain and prevent the muscle spasms associated with slipped discs. The NEOtech Care Back Brace is ideal for individuals who work in manual occupations where heavy lifting is involved. This is also a good brace for sports enthusiasts, as it helps prevent the torso from twisting and causing further injury to the lower back. The Quickdraw PRO is a medical grade back brace designed to reduce lower back pain and keep the muscles, ligaments, and tendons of the back in place. It is made from a breathable, non-flexible material and features adjustable pull tabs that ensure a snug fit. It is ideal for use while working out, lifting, doing yard work, or engaging in other activities that places pressure on the lower back. The FDA-endorsed Quickdraw Pro is backed by 30 years of clinical research that demonstrates its effectiveness in relieving lower back pain caused by sprains, strains, sciatica, scoliosis, and herniated discs. The Quickdraw PRO features a bolster belt design with a patented independent upper and lower tightening system that allows you to customize your level of support. Its lightweight construction adds to the brace’s comfort, while rigid plastic inserts ensure the brace stays in place while bending and twisting. One thing to keep in mind is that while the Quickdraw PRO does not provide a wide enough range of movement for playing sports. Another minor complaint is that the brace can be uncomfortable when sitting or driving. Overall, though, the Quickdraw PRO is an excellent choice for those who want to continue engaging in their everyday activities while recovering from lower back injury. 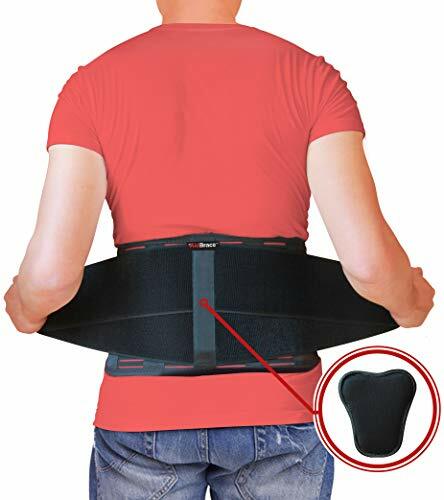 The Mueller Lumbar Support Back Brace is an adjustable dual-layer brace designed to fits waists measuring 28 to 50 inches. It consists of a breathable 28-inch main elastic band and a thick removable lumbar support pad provides extra cushioning for the back and abdomen. Four flexible springs ensure the inner layer of the brace fits securely along the natural contours of the back, while velcro fasteners on the outer straps let you adjust the brace according to your desired level of support. 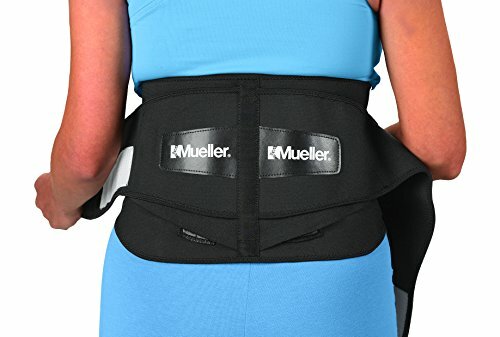 The Mueller Lumbar Support Back Brace’s innovative dual-strap system is based on the inner-strap system, which works by applying pressure to the back while also compressing the abdominal area. What we love most about The Mueller Lumbar Support Back Brace is its versatility. It’s flexible and comfortable enough to wear all day long and can be used with or without the lumbar pad, making this brace an excellent choice for working, working out, driving, or playing sports. Another benefit of the Mueller Lumbar Support Brace is its precise fit. Not only does the brace come in a variety of sizes, ranging from small to XXXL, but it is also very easy to adjust. The removable lumbar pad is machine washable, adding to the brace’s ease of maintenance. One minor complaint about this brace is that it is made of non-breathable fabric. This can make the brace uncomfortable to wear if you are highly active or sweat a lot. Another frequent complaint is that the velcro strips are too strong, making the brace difficult to remove. Despite these small flaws, the Mueller Lumbar Support Back Brace is a well thought out brace that can provide you with the lumbar support you need while allowing you to remain active. 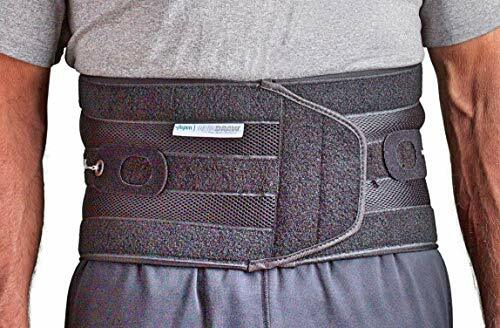 The Back Support Belt by AidBrace is designed for those who engage in strenuous physical activities at work or at home – such as lifting and moving heavy objects, or sitting for long periods of time. This heavy-duty brace measures 8.7 inches wide and 26 to 58 inches long, depending on the size (small, medium, large, extra large, XXL, or XXXL). The AidBrace Back Support Belt provides firm support to the abdomen, hip, and lumbar areas to relieve lower back pain. It features 6 stability bars which strengthen and decompress the lower back and help improve your posture. It also comes with optional shoulder straps. This back brace features straps on each side with velcro fasteners for easy adjustment. 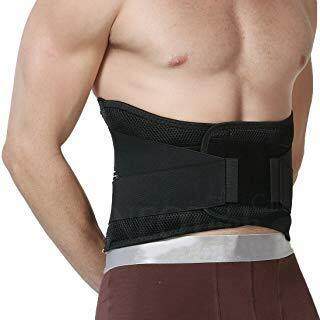 The AidBrace Back Support Belt has a breathable back mesh that prevents sweat from accumulating under the band and keeps you cool as you move throughout your daily activities. It is comfortable enough to wear all day long and won’t slip down, ride up, or bend in half. that said, this back brace is not without its faults. Some users have reported chafing of the skin when wearing this belt, while others have complained that parts of the belt tend to poke into the skin. Despite these minor drawbacks, the AidBrace Back Support Belt is a solidly made product that fits well and provides great lower back support for highly active individuals. In terms of versatility, adjustability, and comfort, the NEOtech Care Back Brace comes out the clear winner. Its double-pull design offers the utmost in support and stability while providing enough flexibility for engaging in even the most strenuous of activities. Add in heat retention, which helps prevent muscle spasms, and you have a great all-around brace that will help speed recovery of the muscles and tissues of your lower back and allow you to return to your normal activities as soon as possible. Choosing a back brace from the dozens that are available can be difficult, especially if you don’t know what to look for. The information contained in this guide should help you understand the different back brace types and features that are available so you can select the best one for your needs. In addition to getting a back brace to help with back pain, other tools such as getting a lumbar support for your office chair, an ergonomic kneeling chair or trying a standing desk could also help with your back pain. Also stretching the lower back is an effective way to fight lower back pain. If you’d like to try some out, be sure to check out our page on the best lower back stretches for back pain.